Annual energy costs are determined via: $/year = (BHP)(kW/BHP)(days/year)(hours/day)($/kWh) making it easy to compare the economics of the airflow-control options. Consider that Company A wants to adjust its air movement system to operate at 20 inches of static pressure (SP) at a volume of 105,000 cubic feet per minute (CFM). It is deciding between using a fixed-speed motor running at 1,180 RPM with dampers or a frequency inverter-controlled motor. Figure 1 -- Damper control: Inlet damper requires much less power than outlet damper for the same performance. Basis: motor running at a fixed 1,180 rpm. Outlet Dampers. 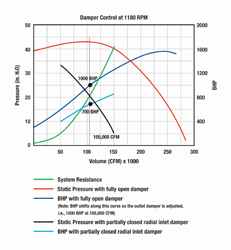 Partially throttled outlet dampers can achieve the desired static pressure and volume at 1,000 BHP (Figure 1). The annual operating cost, therefore, is: (1,000 BHP)(0.746 kW/BHP)(350 days/year)(24 hours/day)($0.05 /kWh) = $313,320. Inlet Dampers. Partially throttled radial inlet dampers can reach the same static pressure and volume at only 700 BHP (Figure 1), cutting the annual cost to: (700 BHP)(0.746 kW/BHP)(350 days/year)(24 hours/day) ($0.05 /kWh) = $219,324. Frequency inverters. 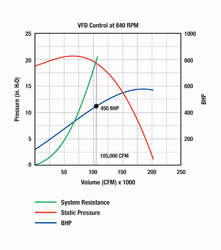 Employing a frequency inverter allows achieving the same operating pressure and volume at a fan speed of 840 RPM (Figure 2). The figure shows that this reduction in speed drops the required horsepower to only 450 BHP, which generates an annual operating cost of: (521 BHP)(0.746 kW/BHP)(350 days/year)(24 hours/day)($0.05 /kWh) = $140,994. Figure 2 -- frequency inverter control: For the same performance as in Figure 1, frequency inverter cuts power requirement substantially. Basis: motor control at 840 rpm. So, Company A will save 55% of the energy costs by choosing a frequency inverter over outlet dampers and nearly 36% over inlet dampers. In addition, it may realize additional savings from the reduced equipment wear and tear that a frequency inverter provides compared to dampers.